As you can see from the picture it is a very unique Detroit – it has a ‘fake’ radiator on the front in contrast to the standard mirror image front and back trunks of the majority of production. This model also had the original battery option upgrade: Thomas Edison Battery Co. Nickel Iron batteries that lasted until the 1990’s! Most people think that electric cars are a recent phenomenon. The truth is that in the early 1900's the electric car was a common site on the American road. Electric cars were used in a large part by women and doctors. Doctors needed a car that they could get in and go and gasoline engines were not that easy to start or reliable. Because hand cranking a car was difficult to say the least and could be downright dangerous the electric cars were very popular with women. In fact one of the downfalls of early electric cars is that they were thought of as a women's car and men did not want to be seen driving them. In fact in the latter years the cars were built with what looked like a radiator in front. An example is the picture above of the 1912 Detroit at Stave Falls outside Mission B.C. The real killer for the electric car was the invention of the electric starter or at least the first practical one in 1911 by Charles F. Kettering of Dayton Electric Laboratories (DELCO). It was first used in 1912 by Cadillac. It was rapidly adapted by other mid to high priced brands as Kettering and Henry Leland (who financed it along with ESB) felt it was too important to keep exclusive. Interesting note: The expression that someone is "cranky" comes from trying to start a crank car with out much success. When it would not start it was being cranky! There were of course other factors in the demise of the electric car. The price of a Detroit Electric in 1914 was about $2,650 and if you wanted to upgrade to the Edison Nickel Iron batteries that went up about $600. At the same time you could buy 2 new model T's for that same $600. 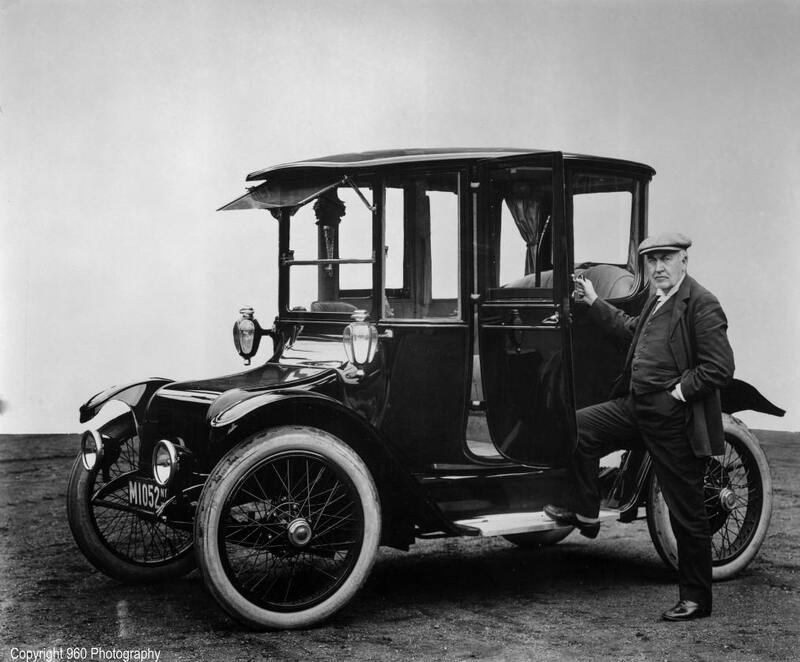 Thomas Edison and Henry Ford decided to work together to make the electric car the main transportation in U.S.. Their goal was to have charging stations where people could "fill up" their cars. In 1914 Edsel Ford was given the task of looking into electric car production. He had two prototypes made with guidance from Edison, but the concept was not developed. Henry's wife Clara refused to drive gasoline cars or "explosion cars" as they were called (mostly by electric car salesman). Henry bought Clara a new Detroit Brougham every two years from 1908 to 1914. Ford Museum owns that last car and a 1922 that was donated later. Her 1914 model 47 resided at Fair Lane from 1914 thru the 1930's. There is 1 1915 currently on display at the Ford museum in Detroit. The 1915 is on loan and belonged to Helen Joy, the wife of a Packard executive. Henry Ford was reportedly quoted saying that he would die a failure if he did not die broke and planned on spending his fortune to make the electric car the mainstay of American transportation. There are stories of mysterious fires at Edison's laboratories and the impression is that these were caused by the early oil cartels. Whether that is true or not I have no idea, other stories say the fire was mostly in an adjacent building and battery production was not significantly affected. No proof can be found to show any evidence that oil companies or other car companies had anything to do with the demise of the electric car. In fact the Rockefellers and others were buying them for their own use. 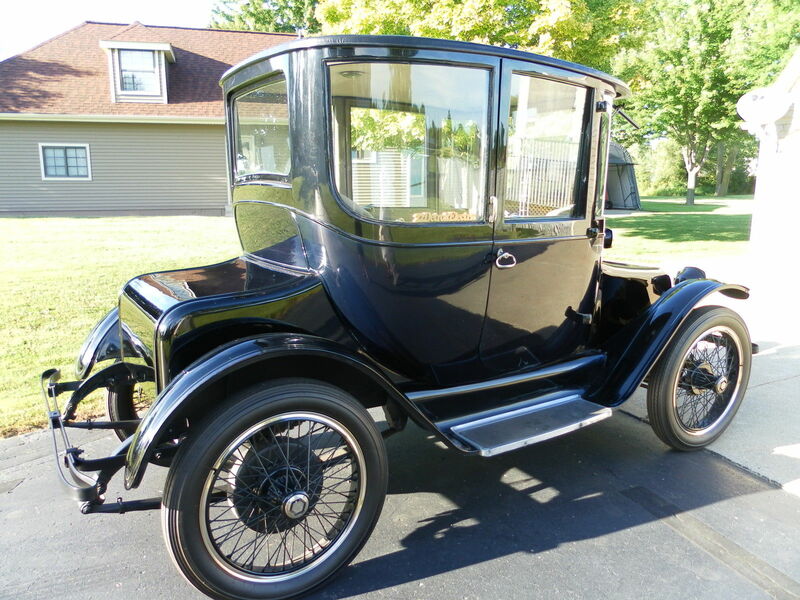 I purchased a 1914 Detroit Electric model 43 in the fall of 2006. This classic antique electric car has been on blocks since 1947. I will post pictures of the restoration as soon as I truly get started. At this point I am focusing on acquiring the missing parts from my 1914 Detroit Electric. The car is actually pretty darn complete. It is missing the two carriage lights as well as the two headlights. One of the front side windows (the curved ones) is broken and the lower section of the windshield is missing. Externally that is about all that is missing but of course it needs some TLC and then some paint. On the inside the volt amp gauge is missing as is the bud vase and the light bulbs (and covers if they had them). Other than that the car is pretty complete. Of course the interior is about as ratty as the paint but you can see the original material. All of the mechanisms for the original roller blinds are still intact. In 1907 the Anderson Carriage company produced their first electric car. The Detroit Electric was rated at 80 miles per charge with the record of over 211 miles on one charge. 100 years latter we have electric cars that can go well over 100 miles on a charge. The early electric car had a top speed of about 20 mph while today's electric cars can do over 75 mph.